A cheesy 20-minute dish that fits into your healthy eating plan? Oh, yes—there is such a thing. 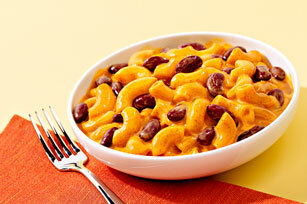 Behold the VELVEETA Chili Cheese Mac Skillet. Combine beans, water, Seasoning Mix and Pasta in large skillet. Bring to boil; cover. Simmer on medium-low heat 10 to 12 min. or until pasta is tender and most of the water is absorbed. Remove from heat. Omit beans. Brown 1 lb. lean ground beef in large skillet; drain. Add water, Seasoning Mix and Pasta; stir. Continue as directed.